Already the midterm of the Google Summer of Code, and I didn’t post updates like I wanted. I guess thinking and hacking is still more easy and fun for me than writing. However, let’s correct that. The least I can say is that the warp tool is in better shape than the cage tool the same time last year. The reason is simple, I learned a lot last year, and the warp tool need similar skills, and even reuse some part of the code. All the tool’s infrastructure is here and functional. We can apply stroke and deform the canvas. Actions on the canvas are done with a round brush, with a gaussian like influence curve. Tool’s options are strength, size and hardness. 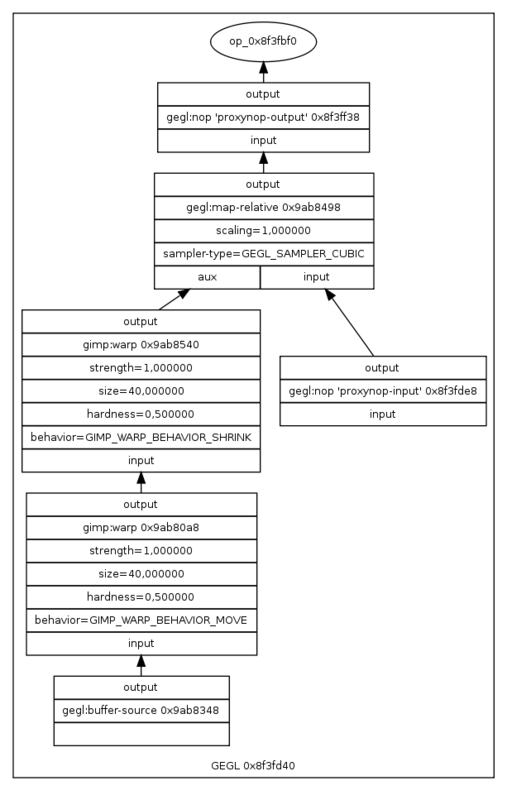 Each actions on the canvas are implemented as a Gegl operation that produce a relative coordinate buffer, that is inserted in the render graph. The final image is computed with a map-relative render operation. Performances need enhancement. For now, for each stroke on the canvas, each operation already computed are re-rendered (cache does not work correctly), and this for the complete surface of the selection (the legagy code wasn’t designed for that). Other areas for improvement exist, such as the implementation of copy on write (COW) for GeglBuffer. The ultimate goal is to perform actions interactively. A good tweaking is needed. For now, behaviors are not consistent. UI implementation, as specified by Peter Sikking and his team. As I’m more confident this year, I’m going a bit deeper and I work on related things, especially in Gegl. An interresting thing is that the warp tool is structurally close than a paint core, and is therefore a step closer to a paint core based on Gegl in Gimp. That’s it ! This summer again, i will participate to the Summer of Code program ! My last year’s contribution was for me a huge challenge, a way to learn a LOT of things, to meet and work with some very interesting people, and a big source of pride (even for my family, here we can see how much Google’s name mean something for the society nowadays). This year, I’ll use the knowledge I learned last year to rewrite the old plugin iWarp as a real internal Gimp tool. His pretty name will be the Gimp Warp Tool). That’s a feature that has been asked and waited for long. Here again, this tool will fit in the ‘big picture’, the future of Gimp (Gegl, live on-canvas preview, ..). This time, I should be able to do the job right the first time (as opposition to the cage tool, that was kind of a prototype at the end of the summer), and avoid the 3 or 4 partial rewrite that was needed after the deadline. 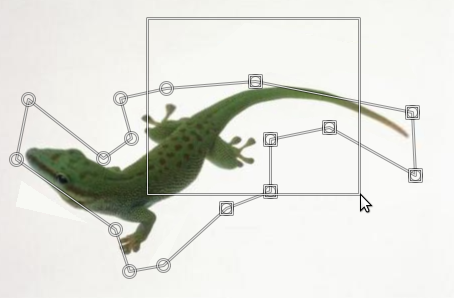 With a bit of luck, this tool can be included in Gimp 2.8. The start of the coding period is in fact not so far !